Sonke Gender Justice and Wits School of Public Health (2015). One Man Can randomised control trial in Diepsloot, Johannesburg: Sonke CHANGE Trial. Sonke Gender Justice and Wits School of Public Health: Johannesburg, South Africa. Sonke’s flagship programme, One Man Can (OMC) campaign, an existing multi-level intervention that engages men to confront harmful aspects of masculinity and to address gender-based violence and HIV & AIDS, with the goal of achieving gender equality, is being adapted for a research trial and implementation in the fast growing peri-urban settlement of Diepsloot, north of Johannesburg. 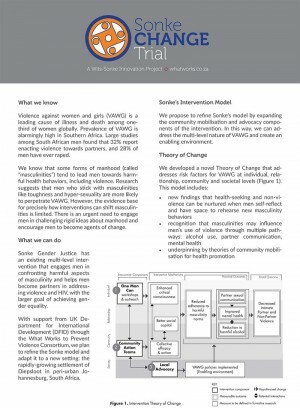 The trial is funded by the UK’s Department for International Development (DFID) through the What Works to Prevent Violence Consortium and will be led by Sonke Gender Justice and the Wits School of Public Health. Dubbed CHANGE, this is a cluster randomised control trial (RCT), and it’s scheduled to take place over a little more than two years, starting in October 2015, ending in March 2018.